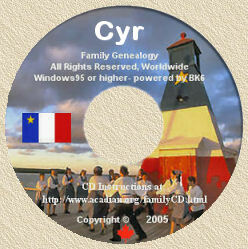 Acadian Genealogy Homepage; Searching SURNAMES on the "In Search of Our Acadian Roots" CD-ROM! I receive many requests to "search" the above noted CD-ROM for specific SURNAMES and, while I have no objections to doing that, it can be quite a monumental task given the fact there are 519,008 names on the CD. So, before asking me to provide details on a specific name, please check the "SURNAMES" Page of the "Acadian Genealogy Homepage". If, following your "search", you are unable to locate the surname which is of interest to you, it would be most helpful, if you could provide the name(s) "Soundex Code Number", when submitting your request. The Rand Genealogy Club provides an excellent "Searchable Soundex Index" and you need only "click" their underlined name (just above) which I've "hot-linked", to obtain the required soundex code from their Home Page. Once you've sourced the required soundex code, just use the "BACK to previous Page" on your Web Browser and send your request to me by "clicking" my E-Mail Address (located at the bottom of my Page), or send an E-Mail message to me at: [email protected] and I'll be happy to provide the information you want. I should also point-out, that it is my intention to eventually have _every_ surname on the Acadian CD listed on this Web Site however, this is quite a task and it may be some time before I get this finished. The Soundex is a system of assigning an Alpha-Numerical code to each surname. It codes names by the way they sound, rather than the way they are spelled. Why do you need to know the Soundex value or your surnames? Because there are Soundex indexes to the 1920, 1910 (some), 1900 and 1880 (some) census. In short names, if there are less than 3 numbers, use zeroes. Double letters count as a single one. On long names, once you have 3 numbers disregard the rest of the letters. For example, PHILLIPS is coded P412: P because it is the first letter of the surname, 4 because H and I are disregarded, so the first letter to be coded is L. The second L is disregarded, as is the I. The next letter to be coded is P (1) and then S (2). Now try a few on your own.